Throughout 2011, the AAEP's Good Works Campaign will spotlight AAEP-member practitioners whose volunteer efforts are improving the health and welfare of horses. Dr. Richard Markell, a vet with the J.F. Shea Therapeutic Riding Center in Orange County, a NARHA Premier Accredited Center, is profiled on AAEP's website. The AAEP invites horse owners and organizations to nominate veterinarians who have contributed veterinary services or resources to benefit horses and the local equine community. Each month, the AAEP will select a veterinarian nominated by a horse owner or organization for special recognition. 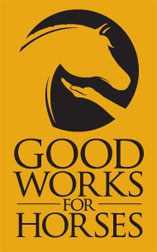 Monthly honorees will be considered for the 2011 Good Works Award, to be presented during the 57th Annual Convention in San Antonio, Texas. The deadline for horse owners and organizations to nominate a veterinarian for January is Jan. 31. Please be aware that as of January 1, 2011, the mileage reimbursement rate will be 51 cents per mile. Please pass along this information to your volunteers. Click here to download the NARHA reimbursement request form. Congratulations to R.I.D.E.S. of Caledonia, MS, which was awarded a $5,000 grant in December from Microtek/Ecolab Foundation, a local manufacturing company that makes medical supplies. "The grant is to be used for general purposes," said Patty Hudgins, executive director. "Our long-range plan is to begin a driving program for the center. This follows on a donation by a local horseman of a trained to ride/drive miniature horse." In addition, Hudgins said that they would allocate some of the funds to assist volunteers pursue NARHA instructor certification. "We are making 'strides' in our program as we add riders," Hudgins said. "We have added more lesson sessions as we grow. We appreciate all the information we receive from NARHA that helps us strengthen R.I.D.E.S." Claire Danes, the actress who portrayed Temple Grandin in the HBO movie of the same name, won a Golden Globe for Best Performance by an Actress in a Mini-Series or Motion Picture Made for Television. Grandin was diagnosed as autistic at a young age. As an adult, she has been an outspoken advocate for those born on the autistic spectrum. As a professor at Colorado State University, she has also made many notable contributions to the ethical treatment of livestock. Grandin was the keynote speaker at the 2006 NARHA national conference. Click here to view Danes' acceptance speech and read an interview with Temple Grandin on the red carpet. has announced the opening of applications for the next Gypsy Angel. Applications will be accepted January 1 through February 15, 2011. Applications are open to any and all applicants, for all types of equine-assisted activities and therapies programs. 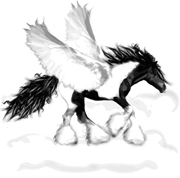 The American Gypsy Horse Angel Foundation works in partnership with the American Gypsy Horse Breed Association to place Gypsy horses into EAAT centers. Last spring, the Angel Foundation received 41 applications for the award. Because they received so many highly qualified applicants, the Angel Foundation made the decision to place THREE Gypsy Angels! The foundation, which only awards horses to NARHA centers, awarded Gypsy Angels to J.F. Shea Therapeutic Riding Center in San Juan Capistrano, CA; Hearts & Horses Therapeutic Riding Center in Loveland, CO; and National Ability Center in Park City, UT. Please e-mail secretary@aghaf.org for more information and to download the Gypsy Angel application form. Equine Specialist Workshops: NARHA would like to accommodate individuals eager to be certified as Equine Specialist in Mental Health and Learning by holding more workshops and practical horsemanship skills tests. Help us add workshops for 2011! Workshops will now be offered with the new Equine Specialist in Mental Health and Learning practical horsemanship skills test if the host site chooses. Host sites can also host the practical horsemanship skills test without a workshop if they wish. This skills test is a requirement for certification. If anyone is interested in hosting at their NARHA Premier Accredited center or for more information, contact Tara McChesney, (800) 369-7433, ext. 114. Intent to Host: Click here to download the intent to host forms for all NARHA events. NARHA hopes that 2011 will be full of exciting events! Please read through the intent to host packets for details concerning hosting an event. We would love to add more driving workshops, vaulting workshops and certifications to the 2011 calendar! Contact Kelly Sullivan, (800) 369-RIDE (7433), ext. 104 with any questions regarding the 2011 workshops or hosting process. Thank you! Unless otherwise noted, contact Kelly Sullivan at (800) 369-7433, ext. 104 or Tara McChesney at ext. 114 for further information. All dates are subject to change. We plan to host more Equine Specialist workshops and practical skills tests after the pilot. At this time there is a potential to have events in CO, MA, TX, TN and NH. Dates and more information will be released after the pilot event.